Methods. We present two-dimensional velocity and velocity dispersion fields for 33 ETGs, including fast (FRs) and slow rotators (SRs). The velocity fields were reconstructed from the measured PN velocities using an adaptive kernel procedure validated with simulations, and extend to a median of 5.6 effective radii (Re). We complemented the PN kinematics with absorption line data from the literature, for a complete description of the kinematics from the center to the outskirts. Results. ETGs typically show a kinematic transition between inner regions and halo. Estimated transition radii in units of Re anti-correlate with stellar mass. SRs have increased but still modest rotational support at large radii. Most of the FRs show a decrease in rotation, due to the fading of the inner disk in the outer, more slowly rotating spheroid. 30% of the FRs are dominated by rotation also at large radii. Most ETGs have flat or slightly falling halo velocity dispersion profiles, but 15% of the sample have steeply falling profiles. All of the SRs and 40% of the FRs show signatures of triaxial halos such as kinematic twists or misalignments. We show with illustrative photometric models that this is consistent with the distribution of isophote twists from extended photometry. Conclusions. ETGs have more diverse kinematic properties in their halos than in the central regions. FRs do contain inner disk components but these frequently fade in outer spheroids which are often triaxial. The observed kinematic transition to the halo and its dependence on stellar mass is consistent with ΛCDM simulations and supports a two-phase formation scenario. 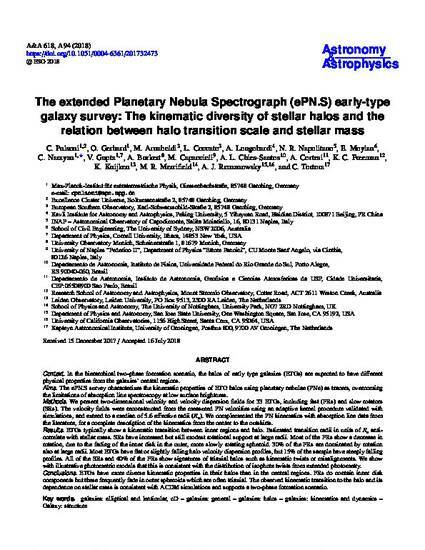 This article was published in Astronomy & Astrophysics, volume 618, issue A94, 2018 and is also available at this link.